Let me start by saying that 95% of business professionals do not need a paid account. The simple answer to the question is use the free account until you find there are things you can’t do that are important. The more complicated answer is it depends. In this article I want to look specifically at the benefits of Business Premium and Sales Navigator accounts, I will not be covering the JobSeeker or Recruiter products. The big advantages of this account are the removal of the free account search limit, visibility of the last 90 days worth of your profile viewers and the ability to send InMails (direct messages) to people whom you are not connected to. LinkedIn don’t specify what the search limit is on free accounts experience suggests it is somewhere in the range 60-100 and may vary by individual. Browsing your 1st-degree connections from the connections page. Searching for jobs on the jobs page. NB: Neither does the search limit apply to searches on the LinkedIn app. On the face of it the InMail allowance is pretty miserly, however, the feature is designed to reward good practice and punish people who abuse it. If someone replies to one of your InMails then you receive a credit even if that response is “not interested”. In this way, you can, in theory, build up a never-ending supply since every month you get a fresh allowance. LinkedIn has put the onus on us to craft well designed, non-spammy, messages that people will respond to. Clearly, InMails are potentially a very valuable tool especially for contacting hard to reach contacts. As you might expect InMails get a much higher response rate than a cold email, you can think of it as low volume, targeted precision email. Are there alternatives? Well, yes, you could incorporate your message in a connection request and this can also work well. However, a connection request has a maximum of only 300 characters compared to 2,000 for an InMail. There is another option which is often overlooked, almost as good as InMails, and it’s free. You can direct message anyone in the same group – up to 15 messages per month. So, if there is someone important that you want to contact, check out on their profile which groups they are in (under interests), join one and when accepted hey presto you can message – no limit on the number of characters. Who viewed your profile is the single most used feature on LinkedIn. We like to know who is showing interest in us. From a business point of view that makes a lot of sense. Yes, it’s true some people choose to view profiles anonymously but the vast majority don’t. A quick check through my last 100 profile views showed just 9 were anonymous views. An increase in views shows your influence and visibility is growing and every picture tells a story – in this case, profile pictures. Something has prompted that person to look at your profile. Perhaps it’s an existing connection who visited your page to send you a message, or someone who had read one of your posts and wanted to know more, or even a competitor checking you out. Profile views can be a goldmine of opportunity. A premium account allows you to review the last 90 days of viewers and gives you the option of messaging second and third degree viewers to find out more. Of course, you need to be selective, InMails are precious and need to be used carefully. There are also the options to send a connection request or a group direct message as mentioned above. Team and Enterprise versions of Sales Navigator add extra functionality such as CRM integration and management dashboards which can be compelling benefits for larger organisations. The professional version which I am focusing on here has 90% of the functionality of the more expensive versions. 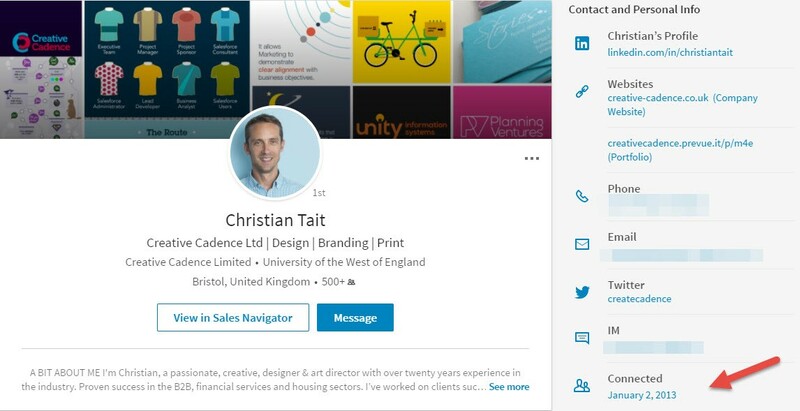 It’s important to realise that Sales Navigator is not a stand-alone product it works alongside LinkedIn.com. 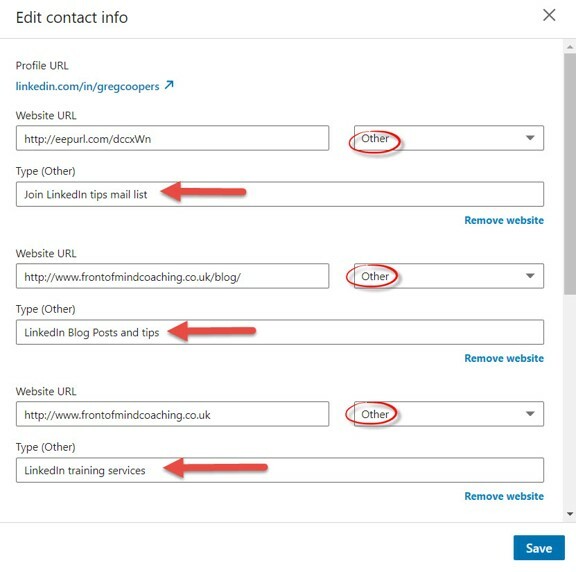 For example, you can not edit your profile, or access your groups, clicking on a prospect’s posts will take you back to the main LinkedIn screen. And this is lack of integration is probably the biggest drawback of Sales Navigator. If you can find a way to work Sales Navigator into your work pattern then it can be a very effective tool. It’s particularly powerful for business and salespeople who are targeting a small number (30-150) accounts, as Sales Navigator enables you to focus in on specific decision makers in those organisations. This is often called account-based marketing. For many people, the deal clincher with Sales Navigator is its search power. There are no less than 23 people search filters including company size, years in post, and keyword content, in addition, using an account search filters include company headcount growth, department headcount, annual revenue. One of my clients, an HR consultancy, was able to identify companies in a specific turnover range who had one or no HR employees. Gold dust. In my opinion one of the single most valuable but overlooked features of Sales Navigator is the ability to search within groups – even groups you are not a member of. Which is the right account for you will come down to individual circumstances and particularly your target audience. If you are selling high-value products or services to larger organisations then Sales Navigator would in most cases be the best investment. Similarly where company size is an important criterion for you then Sales Navigator may be your best route but not always. Consider a company who sells to Facilities Managers or IT Directors, the titles alone will qualify the business as a prospect. If Sales Navigator is overkill but you find you are regularly breaching your search limit, then Business Plus is the best solution. Business Plus also gives you visibility of the last 90 days of profile viewers and a monthly allowance of 15 InMails. If you are still not sure if a paid account will be a worthwhile investment then LinkedIn allows you to take out a free 30 day trial of one of the premium accounts (not both). And if none of the above features are really important to you stick to the free account until you find that you really cannot do what you need to, it’s probably exactly the right account for you – as it is for 95% of LinkedIn users. To attract customers you need two things (a) visibility and (b) credibility with your target audience. LinkedIn is unique in giving you the tools to do both on one platform. When I was researching this article I read numerous articles about LinkedIn and SEO and had several conversations with SEO expert Nick Brown of the Accelerate-Agency. Nick explained to me that the top three ranking factors are: backlinks, brand, and speed. But it was what he said next that made me think again about LinkedIn and SEO. He told me how by focusing on BRAND his agency had significantly accelerated their visibility and their SEO site-wide, simply by connecting with people on LinkedIn and posting regularly. In only 4 months he had grown his network from 300 to 18,500 connections. Building a strong presence on LinkedIn is one of the best things that small and mid-sized businesses can do to boost their SEO. Arguably, even more important than your visibility on Google, is the ability to create visibility with your own LinkedIn network. After all, these are people you have chosen to connect with because they have direct or indirect relevance to your business – a custom audience. For many businesses creating visibility with this audience is just as important, sometimes more so, than getting to page one on Google. For example, one of my construction industry clients with a 10 person sales team had 1.000 connections collectively when I started working with them, after 9 months that had increased to 30,000 and their LinkedIn posts were generating tens of thousands of pounds of orders every month. Your LinkedIn profile is the shop window for both your business and your personal brand. If you get it right it will help you to stand out from the competition, achieve maximum visibility with your target audience and become a lead magnet. In PART 2 I will share with you my top tips on how to fine-tune your profile for maximum visibility. Here are my top 12 practical tips for boosting your profile visibility on Google and on LinkedIn. But don’t stop there, make sure you have filled out the profile fully, including the experience sections and added any extra sections that are relevant such as projects or courses completed. Your LinkedIn URL is your unique LinkedIn address. You can personalise this and make it easier for Google to find you. If you have a common name you may have to be a little creative e.g. use a middle initial or reverse your first and surname for example. Add this URL to your email signature and on all your social media profiles possible. Create backlinks to your profile e.g. by including it on guest articles you write. The same applies to naming your background image. It’s a peculiarity of the contact information section design that if you choose “other” in the drop-down menu then LinkedIn gives you an extra line of description. This can be used for adding keywords or anchor text. The line immediately under your photo is known as the professional headline and it defaults to your job title and company, but this is prime real estate. It’s one of the first things people see when they look at your profile or receive an invitation from you. You can use a strapline approach as in Fig 2 below or adopt a simple keyword approach. I have done both. I currently use a keyword approach* (*link at bottom of the article). The headline is 120 characters, which is roughly twenty words. Getting found is only the first step, your summary is the means by which you build trust and credibility in the reader’s mind and persuade them to take the next step. A compelling and relevant summary is essential. It should be written with your ideal customer in mind. For more help check out this article “How to Write a Business Winning LinkedIn Summary” ( *see links at end of article). Keywords are super important on LinkedIn however if you try to stuff your text with keywords it becomes very hard to read. Adding a keyword paragraph titled “Specialities” at the end of these sections is an elegant way of including them without putting the reader off. The experience section is often underused but it provides valuable extra space to showcase your expertise and build credibility. Just like the summary field, this section has a 2,000 character maximum and you can add documents, slideshows, video, pdf etc to add more depth. You can also add multiple current entries – for the same or different positions. In my own profile, I use separate entries for my public courses, my bespoke courses and the LinkedIn Local networking events I host. Each entry gives you an extra 2,000 characters of space! Check out John Courtney’s profile* he has 17 separate current roles in the experience section. No-one says you have to use your formal job title on LinkedIn. Instead of listing myself simply as “Business Owner” I have used the title field to add extra keywords. You will notice also that the experience section, allows you to enter multiple locations. It’s unclear whether adding skills has an SEO benefit or not. Let’s assume it does and make sure that we add relevant skills to our profile. From a jobs perspective, a relevant list of skills definitely does help because LinkedIn’s Recruiter package allows recruiters to search for people by skills; also skills is one of the targeting option available to advertisers. The endorsements feature is often dismissed as being unimportant. Whether or not you feel that endorsements are important I can tell you that many buyers and potential customers WILL consider they are important. You are more likely to convert a profile visit into an enquiry if you have plenty of relevant endorsements. Recommendations are your silent salespeople and are an extremely valuable way to build credibility and trust. Endorsements are useful but recommendations carry much more weight. It’s possible either now or in the future that the number and quality of your recommendations may influence how highly LinkedIn ranks your profile in a search result. Some SEO specialists recommend a minimum of 10. The bigger your network the more opportunities you will find and will find you. Fig 4: How many LinkedIn connections? Exactly how many connections you need to be effective will depend in part on your job role. A Chief Executive in a large corporate may be highly selective on who they connect to, whereas a recruiter will aim for a very large network in their niche to give them the biggest field of candidates. For the average user, I suggest aiming for 1,000 for a sales or business development role 3,000-5,000 should be the target. We have already established that creating visibility with your custom LinkedIn audience is the priority for most business. When someone does a search for your service or checks their home feed it’s your profile and posts that you want them to see. LinkedIn’s algorithm is tasked with showing the most relevant i.e.personalised information to members. Outside of LinkedIn no-one knows exactly what criteria the algorithm uses but it’s going to be based on a mixture of the following: location, topic, completeness of profile, number of recommendations and endorsements (my speculation), popularity of profile, quality of network and importantly closeness of relationship – i.e. the degree of relationship (1st, 2nd, 3rd) and frequency of interactions. It should be pretty clear by now that even a knock-out profile on its own is not enough. To activate your profile and drive more visibility you need to be actively posting and engaging on LinkedIn. That doesn’t necessarily have to take huge chunks of time. For most people 10-15 minutes a day is enough to keep in touch with their network. Anyone in a sales or business development role will spend more time. I hope you found this post useful, do let me know in the comments below. I would also love to hear any examples of when your LinkedIn profile has brought you success. Greg Cooper is an independent LinkedIn consultant and trainer based in Bristol, UK. He is a Fellow of the Institute of Direct and Digital Marketing. For over twenty years Greg ran an award-winning direct marketing agency working with leading technology companies like IBM, SAP, and Siemens. Today he helps SMEs to use LinkedIn more effectively to find, win and keep customers. He runs public and in-house courses including the LinkedIn Essentials Master Class, Sales Navigator, and Social Selling workshops, and Employee Advocacy training. Greg is also the host for the Bristol LinkedIn Local – a pitch free networking event which focuses on building relationships with other LinkedIn members. Just over a year ago a fierce debate was taking place in LinkedIn – to redevelop groups or scrap them completely. In the end the decision was taken to relaunch the feature. 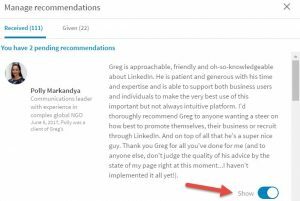 Over the last 12 months, LinkedIn has made big efforts to talk to users including group managers, power users and LinkedIn trainers like myself to understand what they needed to do to fix groups. Last week the new version landed on my desktop (and mobile) and it wasn’t what I was expecting. I am not sure what I was expecting, something radical or revolutionary perhaps but what we have got is the complete opposite – more of the same. Let me explain. LinkedIn had promised to reintegrate groups into the core product and that’s exactly what they have done. When you click on a group you arrive at what looks like your homepage feed – except it is full of group posts, see below. It’s not so radical, not so revolutionary. However, it might just be a very smart decision. The number one challenge for LinkedIn is to drive up user participation and engagement, by scrapping the old interface and mirroring the user’s everyday experience I am guessing LinkedIn believe it will encourage users to jump in. Unless LinkedIn can persuade users to join in more often then groups are dead anyway and arguments about what other features should have been included are academic. Essentially the design changes put conversations centre stage and encourage users to drive the discussions. The role of Managers will become less important. 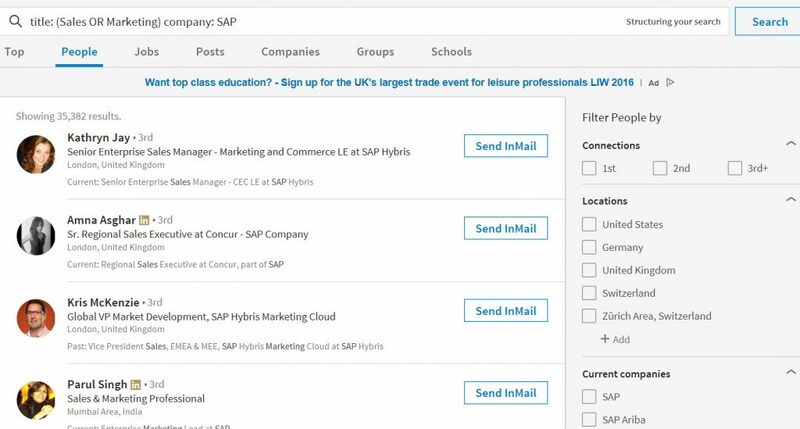 Many managers are unhappy about the loss of group announcement and pinned posts but it seems like this is only temporary whilst LinkedIn roll-out the core design. Better navigation – a groups navigation panel on the home page. 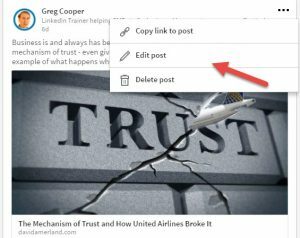 Separately LinkedIn has promised new moderation tools for admins and mentioned that they are exploring the possibility of a pinned post feature which would disappear once a member has read it. As Mitali Pattnaik said – it’s a work in progress and I am encouraged that LinkedIn is investing considerable resources into the project. This is not a token effort. Will the new design save groups? LinkedIn had to do something bold with groups, which to be honest had one foot in the grave. By changing things to look the same they may just have done enough. There is no doubt that business professionals have an appetite for engaging in discussion around topics of interest, just look at the success of Facebook business groups. Personally, I am optimistic that new group design will prove popular. On reflection, it wasn’t commercially or technically realistic for LinkedIn to continue with groups as a separate platform within a platform. By reintegrating the group experience back into the main product LinkedIn has changed the conversation, it is no longer a case of whether the new design will be successful or not, the fact is that LinkedIn has created an additional source of valuable content. Have you got the new version yet? What do you think, has LinkedIn done enough? If LinkedIn is your professional shop window then your profile summary is your shop window’s shop window. 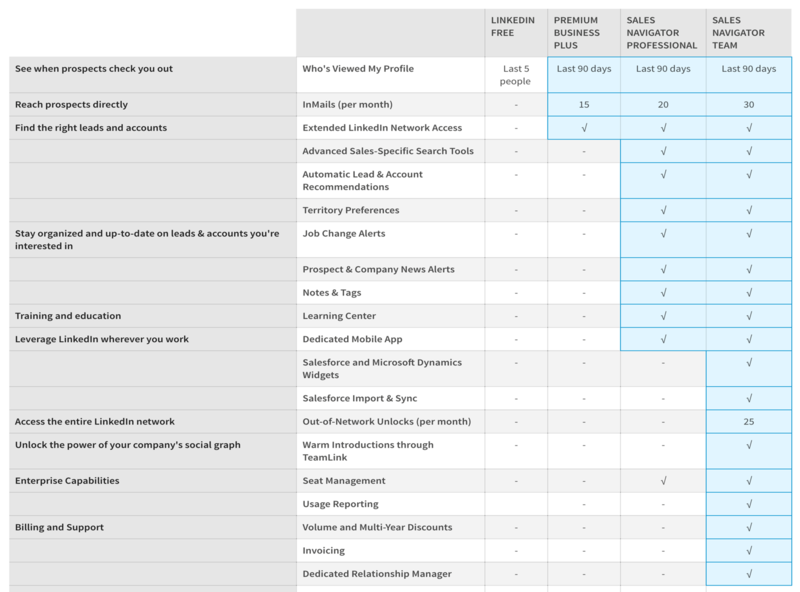 If your role includes sales or business development then it’s probably the most important single part of your profile. What is the point of the summary? Your summary is your opportunity to grab the attention of your target audience. Forget everyone else. It is written to be consumed by your ideal customer. Your aim is to show them you would be a good person to do business with, that you know your stuff and that you can be trusted. You have to add a summary it is not there by default. To add a summary click on the edit pencil just to the right of your profile photo. This will bring up the “Edit intro” screen as below, simply scroll down to enter text in the summary section. In total, you have 2,000 characters available for your summary including spaces – but since the desktop redesign earlier this year only the first 230 characters or two lines are visible on LinkedIn desktop and only 60 characters on mobile. Think very carefully therefore about how you use these first two lines. What is YOUR specific role and expertise? I can’t tell you how many LinkedIn summaries I read and still have no clue what a business is about or what the individual does when I have finished. Just getting these basics right will give you an edge. Remember you are writing the summary to be read by your ideal customer or prospect, with that in mind, describe some of the problems or issues they grappling with and how your product or expertise can offer a solution. No need to go overboard here into a sales pitch, you just need to let the reader know that you feel their pain. The aim is when a prospective customer reads you summary they consciously or subconsciously recognise that they match your customer profile. The average viewer will spend just a few seconds looking at a profile. Therefore the formatting of the summary MUST be easy to read. This means using white space, bullet points, and paragraphs with block capital headings [Tip: you can copy and paste a bullet point list and certain special characters from Word to your LinkedIn summary]. The majority of people just use text in their summary section but there are over 400 media format that you can add to your summary to grab your viewers attention including photos, blog links, pdf, and video. Here is a full list of supported media. You can’t fail to have noticed that if you Google people or businesses, invariably their LinkedIn entries come up on page one. Google loves LinkedIn, And don’t forget LinkedIn’s own search engine known as “Galene”. LinkedIn no longer releases stats on member searches, however, Daniel Tunkelang former Director of Engineering at LinkedIn estimates there are roughly 1 billion LinkedIn profile searches per month. To make your summary ultra visible to search engines you must add the keywords that you want to be found for, ideally more than once. The most elegant way to do this in my opinion, rather than littering them throughout the body of the text is simply to gather up the relevant keywords and put them in a paragraph at the bottom of your summary under the heading “Specialties”. The most powerful salesperson for your business is your customer, including a testimonial from a customer in your summary, is a great way to build credibility and trust, especially if that company is known to your target audience. I use a testimonial from the regional Chamber of Commerce since my business focuses on South West England and Wales and the Chamber has wide recognition in that area conveying instant credibility for me. There is no single right way to write your summary. Each person has their own style. The ultimate test of success is whether after reading your profile and your summary in particular people go on to do business with you. But there is something you can do to check you are ringing the right bells with the right people. Ask a handful of your best customers to read your summary and if they recognise your description of what you do as being an accurate and authentic representation and secondly ask them based on your summary if they came across you for the first time, would they be motivated to find out more. Finally, ask them what they would add or change. If you enjoyed this article and found it helpful, I would really appreciate if you would like and/or share it so others can too. When LinkedIn made major changes to the desktop design earlier in the year many users felt frustrated that features had been removed with little or no consultation. Stung by the negative reaction from members LinkedIn has been working hard to listen to users and win back their good will. If , like me, you have a mistake prone keyboard that throws up typos which you don’t spot until after posting an update, you will be very pleased to see you can now edit the post. This is an important and if you will excuse the phrase overdue option. LinkedIn is planning to introduce an option for women taking time out with child birth to fill the gaps in their LinkedIn CV. Members simply add a new job as “Mom” at “The Pregnancy Pause” to your LinkedIn profile under “Experience” for the duration of the maternity leave. Here is LinkedIn’s official video. am not sure why this is. The blue connect button in search results now gives the option of sending a custom invitation. A connection invitation is the start of a relationship, I always encourage my clients to send personal invitations when possible. It may be a co-incidence but I have certainly noticed an increase in personal invitations since this change was made. On desktop searches I also have a button which says “Preview Message”. I am not sure what this is supposed to do. Right now it doesn’t seem to do anything. The connect button which appears in the list of “People You May Know” however, does NOT currently offer the option to add a personal message. Following the restoration of the “top v recent” sort option for the home page feed, an extra “improve my feed” option has been added to the three dot menu at the top of updates in your feed. It allows you to add more topics of interest, also to see a list of who you are following and unfollow people in your network without disconnecting. 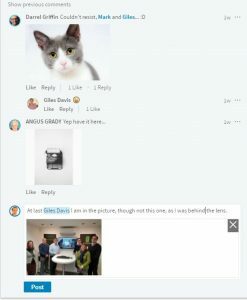 Some time ago LinkedIn announced it would be giving users the option to add images in group discussions threads. This hasn’t happened yet but last week it started to roll out the ability to add images to the thread on a post. Each comment now has a small camera icon in the bottom right corner. In theory people could use this to post advertising images in a thread but in my view it would be a massive own goal as the posts would be quickly reported. If you scroll down to the activity section of someone’s profile it now shows how many followers that person has. For most people the number of followers and number of connections is virtually the same. Is this helpful? I suggest it can be. 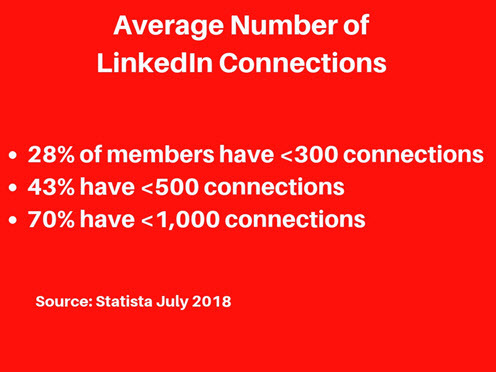 Previously if someone had more than 500 connections that’s all LinkedIn would tell you, so the person could have 501 or 50,000 connections. The size of a person’s network can be a useful piece of information when deciding whether to connect with them. 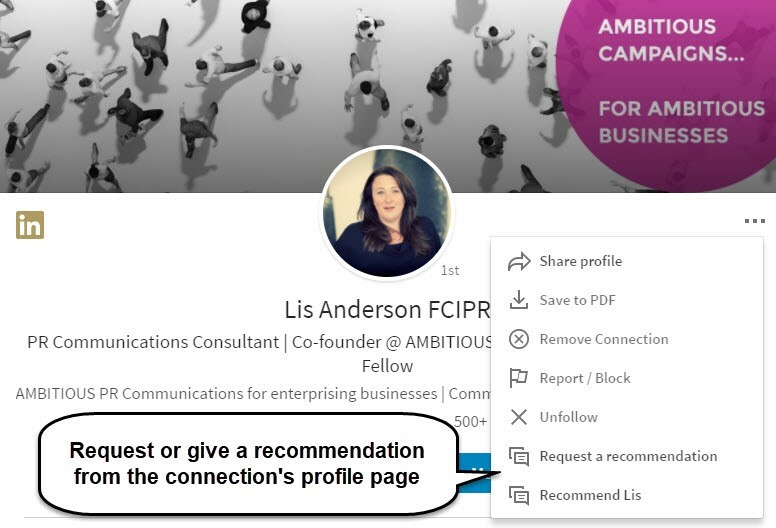 To ask for or give a recommendation you now have to go to the connection’s profile page. Although it has always been the case that you can choose whether or not to display a recommendation on your profile there is now an option to hide new or old recommendations individually. When you publish an article on LinkedIn there is now the option to choose whether or not readers can leave comments. Most people will choose to allow comments but it’s good to give the user the control over that. 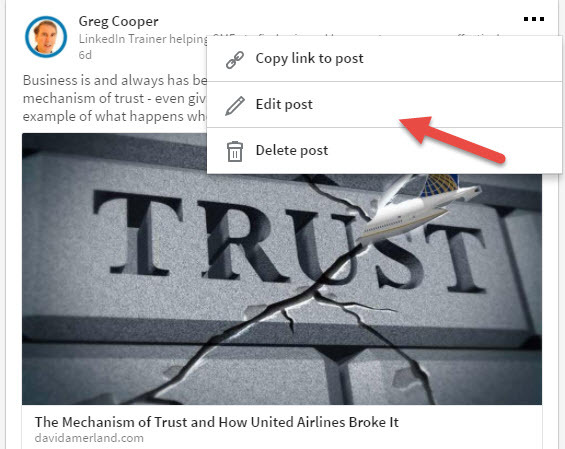 Although you can share an article with multiple groups from within LinkedIn from the end of June you will no longer be able to post to multiple groups using social media dashboards like Hootsuite and Buffer. Most of my LinkedIn training colleagues agree that this is a positive move which should help to reduce the amount of spam posts in groups. Here is the official Hootsuite announcement about the change. 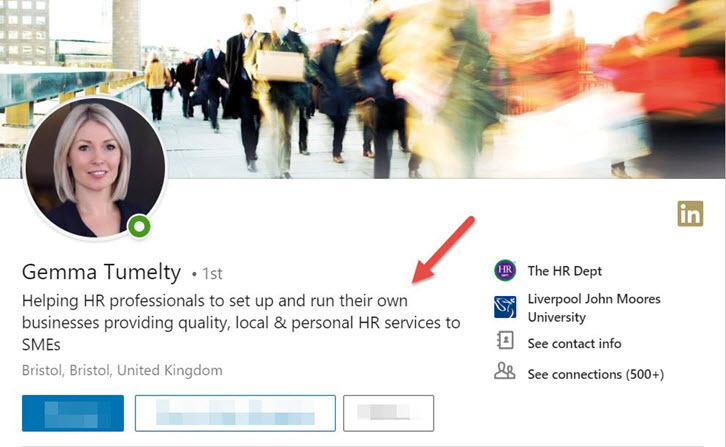 In the contact information of a 1st degree connection it now shows the date when you connected on LinkedIn. A small change but could be a good conversation starter. On June 7th LinkedIn updated the User Agreement. The changes are pretty straightforward including giving users more control over what data is shared. You should be aware that LinkedIn will be sharing your data more widely with third parties which is good for overall visibility, if you are not comfortable with this you can opt out here. Whilst the changes I have highlighted here are not exactly transformational, they do suggest that LinkedIn is continuing to pay more attention to member feedback. 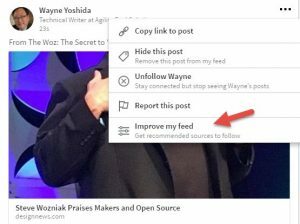 There seemed to be a period when every LinkedIn update involved taking away features, in contrast many updates now are adding useful functionality. There are still features which were taken away which I would love to see restored, for example, the ability to attach a recommendation to the relevant position, and the ability to see who has shared an article post but it does feel that things are moving in the right direction. What do you think of the recent changes? What other improvements would you suggest? Thank you for taking the time to read my post. If you enjoyed this article please like and share it, so others can too. In these days of portfolio careers, it is increasingly common for people to wear more than one hat. You may be a freelancer working for several different businesses or a senior executive with multiple directorships or perhaps you are employed but run a business in your spare time. How do you reflect this on LinkedIn when you are only allowed one profile page? Ultimately there is no one size fits all solution, however, I believe there are some simple strategies that can help you to present the different parts of your work-self in a way that makes sense as a whole. Your professional headline (120 characters) is immediately underneath your name on the profile page. It defaults to your job title but you can use it instead to position yourself by focusing on and describing your core expertise. The reader gets an immediate impression of what you offer. 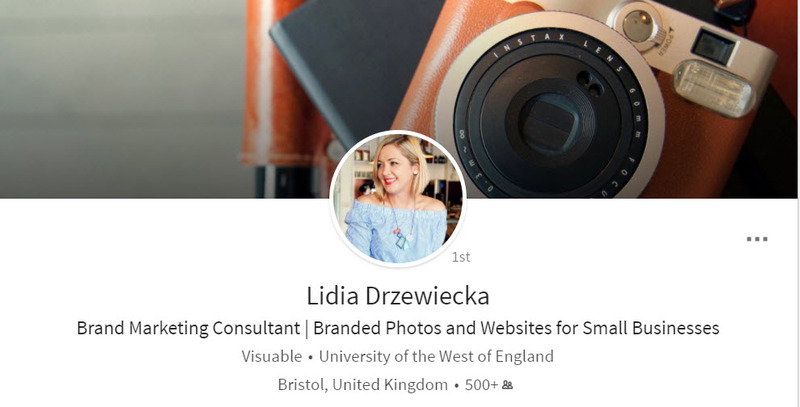 LinkedIn’s custom image gives an opportunity to reinforce your branding visually, without specific reference to a current position. Here is an example of how a freelance event manager is reinforcing his brand with the custom image. LinkedIn’s summary has 2,000 characters you can use this to spell out exactly what you do and for whom. You may also need to explain how the different roles relate to each other. If you have several current roles I suggest decide which role you want to prioritise, create a heading and devote 50% of the space explaining what the organisation does for whom, what exactly you do and how you add value for your customers. Keep it simple, pay attention to layout, use bullet points and paragraphing to make it easy to read, you can add more detail in the experience section. Give 25% of the remaining space to your other roles under separate headings. In the last 25% include a paragraph titled “Specialities”, this is where you put the keywords that you want to be found for across all your roles. This will optimise your profile page for search without annoying your reader by cluttering the main text with keywords. After reading your summary the reader should be able to easily explain your different roles to someone else. 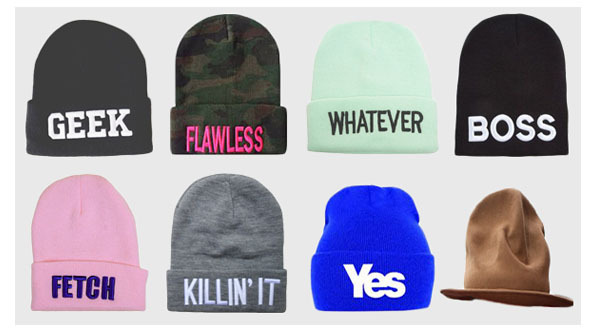 Don’t forget to tell people how they can get in touch with you for each hat you wear. We love images don’t we, still or moving. Adding some visuals to your summary and your experience sections is a great way to grab the reader’s attention and helps them engage with your story. Be careful however not to confuse the reader with too many images in the summary section, it may be better, for example, to save all the role specific images and videos for the experience section of your profile. 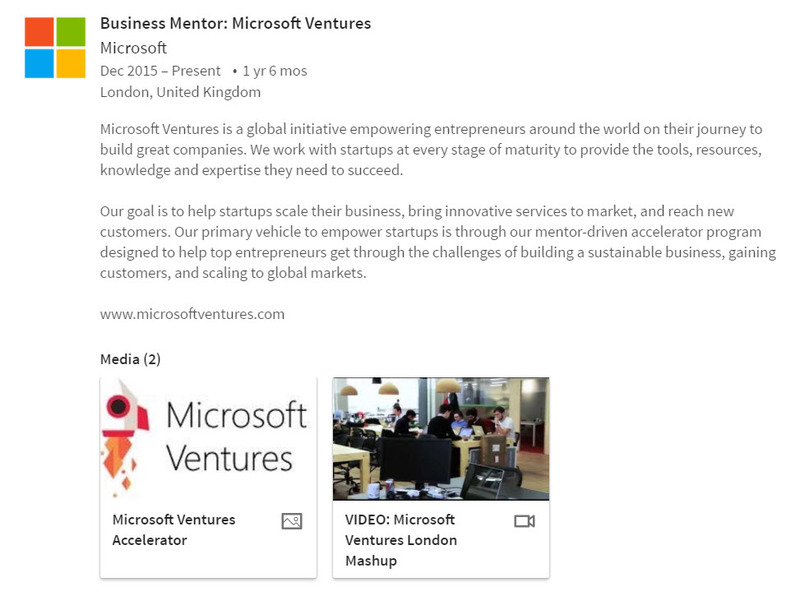 Having given an overview of your roles in the summary you can now give more detail in the experience section. You have 2,000 characters for each position you list so there is plenty of room to expand on each position. If you have multiple roles it may be enough just to summarise the roles’ aim and scope as below. LinkedIn allows us to re-order the top two current positions (but only the top two). Move the role you want to feature most prominently to the top. Use role specific images and videos. Since the LinkedIn desktop redesign and the end of last year only your top 3 skills are displayed, as below. You can re-order these. Make sure the ones showing reflect the emphasis you have given in the rest of your profile. If it’s just too difficult or confusing to choose three representative skills, you can turn off the endorsements feature entirely and LinkedIn will just display a list of all your skills. Writing articles on LinkedIn is a great way to boost your brand and promote your expertise. If you have several very different hats it could be confusing for the reader (and the LinkedIn algorithm) if you write about too many topics. My advice would be therefore that less is more. Write about those topics which are really important to you. Your passion will come across in the article and the reader will be engaged. The approach I am suggesting could be called big picture, little picture because you are using the professional headline and summary section to give an overview of who you are, the different roles you fill, and how this all ties together. In the experience section, you can then give more details about individual roles. I hope this post has been useful and those of you who combine a position as Lion Tamer with one as an IT Analyst, or similar, will see that it is quite possible to incorporate multiple roles into your LinkedIn profile. I would love to hear your ideas on how you have tackled this LinkedIn challenge. Recently I gave a talk on how to position yourself as an expert on LinkedIn to a business audience in the lovely City of Bath. I started by asking how many people in the audience considered themselves experts? Three lonely hands went up. I then reworded the question and asked, “Who here considers they have expertise that their customers value?” Almost everyone in the room put their hand up. Maybe it’s a British thing. Most of us feel uncomfortable calling ourselves experts but that is precisely the reason customers come to us because we have knowledge and expertise that they don’t. Whether or not you feel comfortable with the word, positioning yourself as an expert is an incredibly effective way of marketing yourself and your business. And if you sell to other businesses then LinkedIn is the place to “be known for what you know”. Positioning yourself as an expert is probably the single best marketing investment you can make. When you build a reputation as the got to person for your particular skills then instead of chasing business people start to seek you out. One of the first ports of call a buyer will make to check out your expertise is LinkedIn. Let’s look at the steps that will help you to position yourself and your business as a source of expertise on LinkedIn. There are several ways a potential buyer may come to your profile – as a result of a search, a recommendation, seeing your content, or just a casual visit. When they arrive your aim is to convince them you are the go to person for this product or service. Pay particular attention to the top of your profile. Your photo is the initial visual hook. Do you look professional and approachable? Have you added a custom image which makes you stand out and reinforces your brand? Underneath your name is the professional headline, this defaults to your job title but is a great opportunity to position yourself and your expertise. It is your written hook. The other key feature is the summary. This is where you can expand on your expertise, give examples of what you do, describe the type of customer you are looking for, add a testimonial. We want the viewer to recognise themselves and feel comfortable taking the next step to contact you. On the mobile and desktop, the summary field has now been collapsed into two lines. It’s very important therefore to think about how to start your summary – only the first 200 characters (on the desktop) and 60 characters (on mobile) are visible to the viewer. 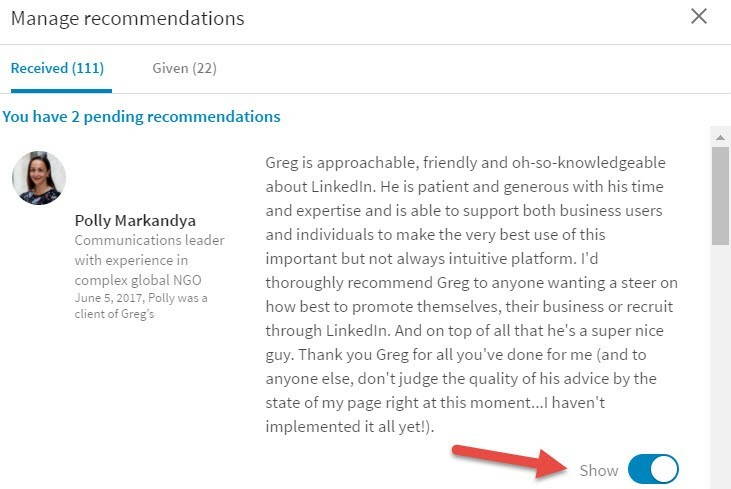 LinkedIn has two social proof features – endorsements and recommendations. Customers will expect to be able to read glowing references for an expert. Experts achieve recognition by writing books or talking at conferences but also by NETWORKING. A broad and relevant network is a crucial tool for building your reputation. The bigger your network the bigger your reach. One of the best ways to expose your expertise is to share valuable content, LinkedIn gives you the opportunity to build a custom audience to consume and share this. As an expert, you have valuable knowledge that your customers want. Giving this knowledge away in small chunks through articles and posts is one of the best ways to build your reputation. At first, this seems counter-intuitive, why will people use you if they can glean your expertise for free? Strangely the opposite is true. Ask people who have written successful books about how to do stuff. Of course, there will be some people who just read the book but there will be plenty of others who get in touch because of the author’s superior knowledge. As a business coach, Peter Quintana, said to me recently no-one wants to pay for someone who is “simply competent”. My advice, therefore, is to publish and be damned. You can be one of the most knowledgeable people ever in your field but if no-one knows about you there are never going to be queues outside your door. One of the most effective ways to spread the word is to build a network of people who like and share your content. Usually, this happens organically. You start to notice people who are regularly liking, commenting on, or sharing your posts. Say thank you show appreciation, where appropriate share their content too. It’s likely that some of this network will be your peers. For example, I am linked to an informal network of LinkedIn coaches all around the world. We regularly share each other’s content. By creating this supporter network or fanbase, your content gets far greater exposure than you could achieve through your own efforts alone. If your content is good it will attract potential customers. LinkedIn notifies us when someone is engaging with our posts, be alert and ready to get involved, without delay. One of my connections, Felix Spender, a conflict management specialists, published an article on LinkedIn about Brexit which attracted thousands of views and over a hundred comments. He quickly engaged with the people who were commenting, responding thoughtfully and respectfully to all the comments. As a result, he was invited to London to meet with the cabinet office, he won a major new contract, and crucially his personal authority received a massive boost. Some people will respond to your content by sending you a connection request. This is another great opportunity to open a conversation. I always thanks people for their invitation then ask if there was anything that prompted them to reach out to me. This regularly results in a sales opportunity as people explain how they would like to learn to use LinkedIn more effectively. If you can offer your customers one or more of these benefits then I would suggest this is based on knowledge that you have that the customer does not. It’s time to start exposing this expertise on LinkedIn to be known for what you know more widely. It’s fair to say LinkedIn’s new desktop design has not been universally welcomed. A petition by a Bristol recruitment manager Mark Jury, to restore lost features, attracted widespread international support. 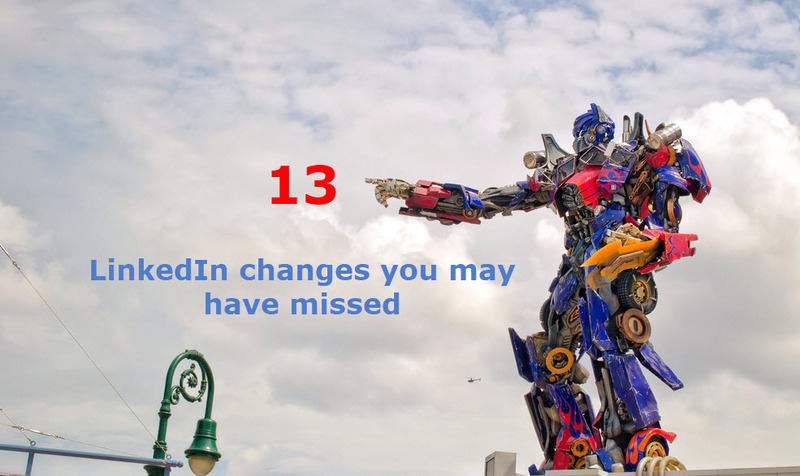 Numerous articles have been published, on and off LinkedIn, decrying the changes. LinkedIn themselves created a forum post for feedback on the design which to date has received nearly 3,000 comments, almost all of them negative. Feel free to add your two-penny worth. The rationale for the design changes is sound i.e. to create a more consistent user experience across all devices, it should make for an easier and more intuitive user experience. The problem as I see it is that LinkedIn management, perhaps under pressure from new owner Microsoft to improve profitability, has rushed through the changes with too little user consultation and insufficient testing. The result is that the new design has been full of bugs. In addition, ill-thought-through changes to the pricing policy have angered users who are being forced into a premium upgrade to keep their favourite features. “We’re always looking for ways to improve the LinkedIn experience for our members. This sometimes means removing features that aren’t heavily used to invest in others that offer greater value”. It creates the impression of an organisation that simply isn’t listening to its users. Many users have canceled their premium accounts. The risk for LinkedIn is that revenue lost by these cancellations could outweigh revenue generated from new premium users. LinkedIn urgently needs to reconnect with and listen to their users. Is LinkedIn in listening mode? There are some promising signs. Along with several recruiter and training colleagues I recently had the opportunity to speak directly to the Director of User Experience Research in San Francisco. As a result of these conversations, changes were made. On February 24th, David Flink, LinkedIn Product Director, Search and Discovery published a post entitled “We heard you we are making some changes to LinkedIn Search” in which he announced several changes including the restoration of some of the previous functionality including additional text field searches, and the return of saved searches. Is there life beyond the controversial desktop update? Right now LinkedIn is being battered by a deluge of user complaints. Clearly, there is some work to do to repair the situation. However, LinkedIn remains the dominant player in this space and despite the missteps with the desktop update, it is still the most credible and widely used online business venue. The good news for LinkedIn and its users is that just around the corner there is a raft of new functionality on its way as the Microsoft product set is gradually integrated. I predict these additional features and extra connectivity will be widely welcomed by users. The storm around the desktop upgrade will gradually die down but Linkedin must learn the lessons. Thank you for reading this, if you enjoyed the post please like and share it so others can too. Love to hear your comments. There has been much wailing and gnashing of teeth about the disappearance of advanced search in the new version. I have also been guilty of that, however on the weekend conversations with colleagues forced me to take a fresh look at the free search feature. It’s not so much a case that advanced search has been removed from the free desktop version as that it has been replaced. In its place, there is a multi-layered search which always begins in the keyword search box rather in multiple text fields as the original advanced search did. Crucially the new desktop version supports Boolean search in key fields. You might have heard people refer to AND, OR, NOT searches, these are some of the most commonly used Boolean phrases. It is also possible to build more complex searches by combining terms in brackets. For example, this search will find people who have Marketing or Director and Division in their profiles. Note, that phrases have to be entered in quotes, and the Boolean operator must always be uppercase. LinkedIn supports Boolean searches in the first name, last name, title, company, and school (college) fields. See LinkedIn’s official help explanation here. Let’s have a look at an example, a search for people with sales or marketing in their titles at computer giant SAP. This is a global search which gives 35,000+ results. I could now refine this with the filters on the right-hand side of the page. Now I will try a different search and look for multiple titles, Fig 2. This search brings up 452 results. I am searching profiles with SAP in the company field, however, that could be a previous position, so if I now select “SAP” in the current companies filter in right-hand panel that brings my result down to 373. I could also use any of the other seven filters mentioned above e.g. connections, location etc. to further refine my search. Here is one more example of a Boolean expression just to make sure you have understood how to build these. I am looking for people who are in a finance role who work at Ecotricity or Scottish Power but aren’t called Green. Pretty powerful stuff eh. I hope you can begin to see now that the advanced search hasn’t so much gone away as morphed into a different type of search. There is one temporary problem which you may have noticed. There is no longer an option to save the search, however, I am assured that LinkedIn does plan to restore this in the immediate future. If any of these filters are business critical to you then you probably should upgrade. Premium accounts also have access to 15 or more saved searches. 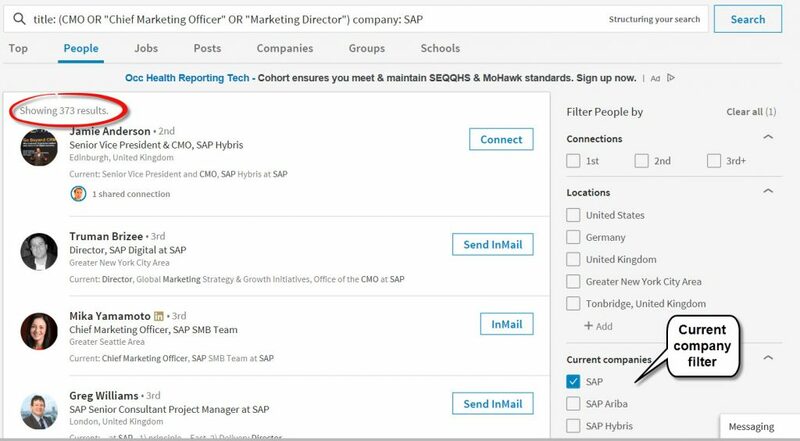 The decision to upgrade is not just about extra filters, it’s also about whether Sales Navigator (or Recruiter Lite) will help you t0 do your job more effectively. 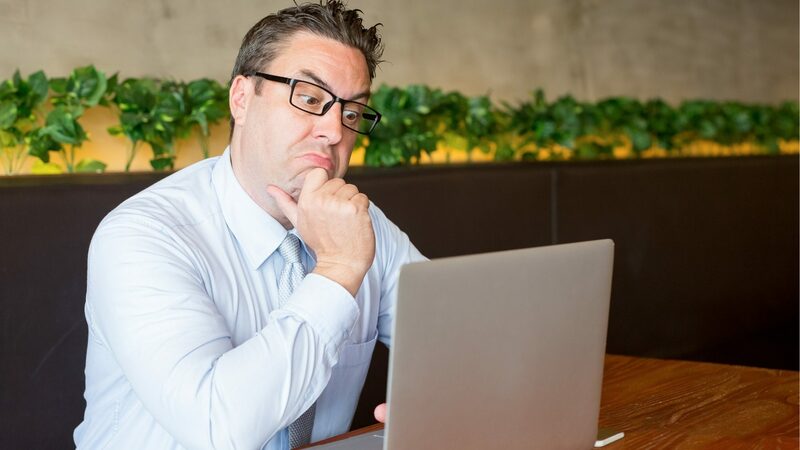 If you are thinking of upgrading then you might find this article helpful: “Should I upgrade to LinkedIn Sales Navigator“. The new desktop version is evolving, we are all still learning how to get the best from it, including LinkedIn. I hope this article has been helpful and given you a fresh perspective on LinkedIn’s new desktop search. All is not lost. In fact, very little has been lost, it’s just different. Love to hear your comments below. Thanks to Mark Williams, Brynne Tillman, and Samantha Bailey who prompted me to look again at LinkedIn’s new desktop search. The secret to finding new business on LinkedIn is simple. Create a credible profile (shop window) then find ways to engage with the sort of people you want to do business with. That’s it, you say? Well, pretty much. Don’t believe me? In that case, I am going to share with you ten practical actions that you can do this week that will help you to get business from LinkedIn. Now just so you don’t cheat and you get a sense of your own progress I want you to look up your LinkedIn SSI score. 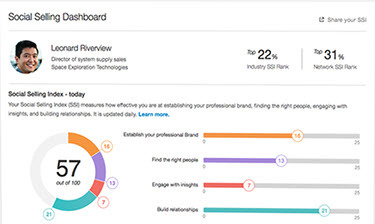 This is a score that measures how effectively you are using LinkedIn. I want you to compare your score at the beginning and the end of the week and let me know the difference. You will see your personal score out of 100. The score measures things like what percentage of your invitations have been accepted, how often people like and interact with your posts, how well your profile is completed. Don’t worry too much about the details it’s just a useful way of giving you a before and after measure. And so to the actions. 1. Review and refresh your profile. Your profile is your professional window. It’s a good idea to review your profile at least every three months. Check all sections have been completed fully, including – most important – the summary section. As a minimum, you should aim for an All-Star profile strength. This rating is normally shown on the right-hand side of your profile page, if it is missing (a temporary glitch on the new version) you can also see it on your profile page on the mobile app. Ask a customer or colleague for feedback on your profile. It’s surprising how easy it is to leave off something that is really important. Fig 1: Does your LinkedIn photo convey the right impression? 2. Review the keywords on your profile. Your Linkedin information can be searched from within LinkedIn and externally by search engines like Google, and Bing. Your LinkedIn profile will invariably be the first result that surfaces when people Google you. 3. Follow up people who view your profile. “Hi, John, I noticed you dropped by my profile recently. It was probably a casual visit but I just thought I would ask, is there anything I can help you with at the moment”. 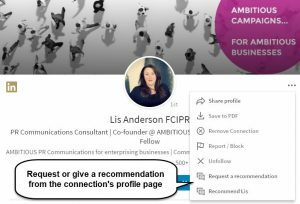 If you have a free account, and the new desktop, LinkedIn have made it much easier to send personalised connection requests. This week’s action: Monitor people who view your profile every day and follow up selectively. Most people on LinkedIn spend more time accepting invitations than sending them. Think about this for a minute. What it means is you are allowing someone else, often strangers, to shape your network. It’s OK to accept invitations (selectively) but you also need to be actively sending invitations to the people you really want to connect to. Tip: Always send a customised invitation. It’s a better way to start the relationship and is more likely to be accepted. This week’s action: Send at least one, ideally two invitations every day. Easy peasy. I regularly get business from this. This week’s action: Follow up everyone whose invitations you accept, even if it is just a simple thank you. This one is really easy as LinkedIn regularly prompts us to do this, but do it with integrity only endorse connections for things that you know they know about. Take the opportunity to say thank you and add a little personal message when someone endorses you. This week’s action: Be generous with your endorsements and say thanks when you are endorsed. If you feel comfortable with writing, then publishing an article on Linkedin is one of the best ways to position yourself as an expert on Linkedin. If you are new to writing on LinkedIn you might find this article useful: Be Known for What You Know. As a guide, I find it usually takes me about 2 hours to write an article; most articles are 500-1,000 words. This week’s action: If you are comfortable with writing, publish one article. I guarantee that sitting in your LinkedIn network are some great opportunities that you have overlooked. One of the quickest ways of spotting these is simply to export your connections to an excel file and visually scan through them. Your brain will make the links and spot the opportunities. Here is a link to the export your contacts option. This week’s action: Export your contacts, review and re-engage with selected contacts. You can join up to 100 groups but it would be impossible to be active in all but a few. I suggest choose two or three where you know that your target audience is to be found in some numbers and stick with these. Regularly join in conversations. Consistency is more important than frequency. This is a great way to raise your profile in your chosen niche or location. I appreciate you are busy and I am asking you to fit something else into an already busy week, that’s why I have deliberately set some modest targets. With the exception of writing an article, if you choose to do that, everything else will take just a few minutes a day. Remember to get your LinkedIn SSI Score first so we have a before and after comparison, and I am also expecting to hear some concrete examples of new business won and opportunities uncovered. And finally, update your LinkedIn SSI Score and share this in the comments below, along with news of business opportunities that you have uncovered. Thanks for participating. If you enjoyed this article and found it useful please like and share it. admin on LinkedIn Relaunches Groups. 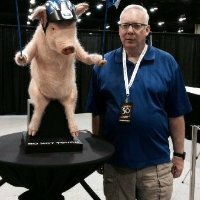 Mike Morrison on LinkedIn Relaunches Groups.